George you nailed it on the head. America and Europe reacting to Islamic fundamentalism is not future shock. Islamic fundamentalism is future shock. The reaction of the West is blow back to a culture that cannot adapt. Two additional contributing pressures, which are rarely noted in this context are the decline in education and growing population. People are less capable of coping rationally with change because they have less real knowledge (despite information overload). They are also increasingly frustrated by the increase of automated or scripted procedures which leave no room for the personal in addressing problems. Attributing pretty much everything disturbing to Future Shock did not impress me in the early 70s and does not impress me much now. I am more than a bit tired of the assumptions of everyone including myself that does who disagree about this or that issue are likely all nitwits or suffering from "future shock" or some other malady. I hope that our AI evolutionary successors have a better go at it. @twhair: "Islamic terrorism" may be due in part to culture shock, but it's a wee bit more complicated than that. It's like, since the 1950s various outside powers (mainly the US and Russia, but also occasionally some European countries and China) have been forcing puppet governments on various Middle Eastern countries until they manage to produce their own "legit" governments which serve the interests of said outside powers above that of their own people. So they tend to be more than a little ticked off at both their own governments and the outside powers which meddled with the situation. There is an element of future shock to it too, I won't deny that. But that's only part of the story. Or it could be that people get pissed and out of sorts when they don't have jobs, their government is spending money that no one will ever have, much less pay back, and their military is running around the world doing everything but protecting their own borders. 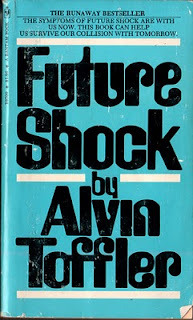 the term "future shock" is a nice conceit for the comfortable. It allows them to dismiss the concerns of other people who just aren't as cool/smart/creative/open minded/pick-your-ego-trip as the rest of us. So it's a wee bit more complicated fallingupthesky...do you know how childish that sounds? With or without US/Russian/European intervention in the internal affairs of other nations do you think the Taliban or some other degenerate system (think anything associated with Sharia)is going to deliver us to the transhuman future we talk about on this website? That last question was not conceit Ken...just an attempt to get you to understand that the long range future of humanity and it's AI progeny is in the hands of Western liberal democracies and not those you so easily make excuses for. "Islamic fundamentalists are clearly being set-off by future shock (what others might call cultural globalization, or Westernification, or imperialism, or whatever). The reaction to their reaction, particularly by Americans, is not directly caused by future shock. Instead, it's a kind of backlash to those who are future shocked, leading to a rise in populism and an insidious quasi-fascism." Not complicated at all...just backlash guys. You hit me, I hit you 10 times harder so you don't do it again. Worked with Japan and Germany 65 years ago, should work the same today. Islam's 1000 year system is being destroyed in the blink of an eye by globalization and instant info access. That's why their controllers are freaking out. Christianity's 2000 year system hopefully only has two blinks left. It pains me to say this but I'd live under Emperor Palin long before I would live under a Draconian system like that found in Saudi Arabia or Iran. John Brunner's fabulous hard scifi 'Shockwave Rider' was published in the mid 70's and directly acknowledges the influence the Tofflers had on it. Highly recommended. Fallingupthesky, I am an American and a live and let live libertarian. If Adam and Steve want to get married and they're my friends, I'll be there to wish them well. But if Jihadist Luddites want to blow up their wedding and kill a bunch of us infidels, then I say send in the Predator UAV. I don't want to pick a fight...I just want the crazies to leave Steve, Adam, and me alone so we can hoist a beer to the long-term future of humanity.